This was actually nothing next to the previous day's -9C. Sometimes common sense prevails. In this instance, assessing my chances of being able to squeeze in a satisfactory 30k run on Wednesday (as I had originally scheduled), meant I moved the long run to Sunday. This gave me the immediate benefit of running in daylight, and, it transpired, meant I could run at all since between Tuesday and Wednesday we had the worst snow since 1982 and temperatures in Oxfordshire dropping as low as -17°C. Still, common sense and long-distance running are uneasy bedfellows. On Tuesday evening, despite great flakes of snow falling, roads becoming icy and general weather warnings being issues left, right and centre, the hardy few of the running club made it out for the weekly club run around Abingdon. We deviated from the originally scheduled 10.5k run because the snow seemed pretty relentless – and there was a consensus that while a short run in the dark might be fun, a long run might be a tad on the dangerous side. Despite using the gym for fair-weather running, I got impatient with the hamster-like exercise and went for a run outside on Saturday. It was crisp and cold, and a chance for me to try out some new Gore-Tex trail shoes. Gore-Tex works great, keeping the water firmly out. That is, until you tread in snow that goes over the rim of the shoe and the waterproof material keeps the water in… Aside from the run being slow due to the snow, I also found out firsthand just how difficult it is to spot black ice. Crossing a road, behind a car – as conspicuous as I could be in day-glow gear – I went flying in spectacular style. Nothing damaged other than my ego, I decided to pick my way across roads much more carefully. If you’re wondering why I’m not tucked up inside, roasting chestnuts on an open log fire and (since I’ve got no place to go) letting it snow, letting it snow, letting it snow, it’s because I’m running the Paris Marathon on 11 April 2010 to raise money for The Stroke Association. It’s only 90 days away, and I’m hopeful that the not insignificant task of making round in one piece won’t be too arduous if I’m well prepared. Anyway, if you’re glad it’s me slipping around and braving the cold rather than you, please feel free to show your appreciation and help make a difference at justgiving.com/lewis-birchon. 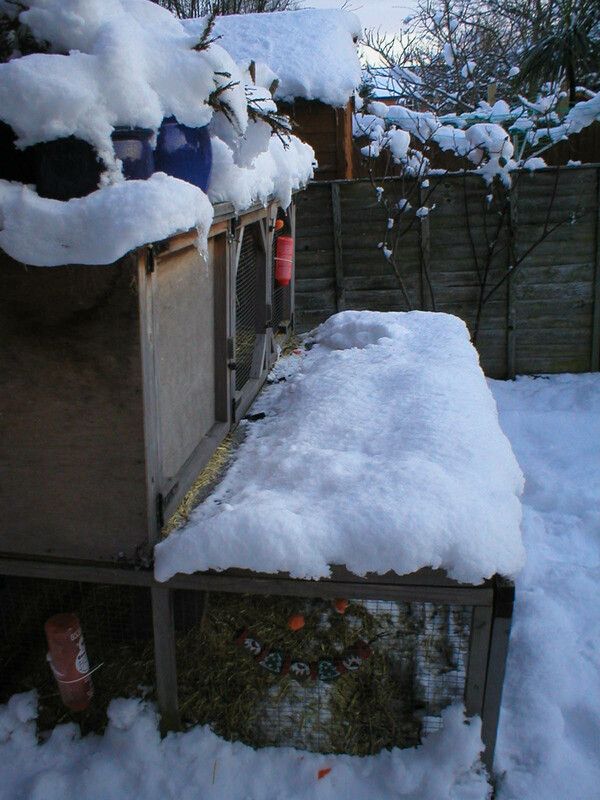 So far the rabbits have been singularly unimpressed with the snow.